The Bearclaw Trapper is a large multi-blade folding trapper design with stainless steel bolsters pre-attached to stainless steel liners. The finished folder makes a fine multi-blade slipjoint style pocket knife. The blades on this model are both 3-1/2 inches long and are made of high quality, mirror finished 440 stainless steel, which has been heat/cryogenically treated. The Bearclaw Trapper is 8 inches overall when open and 4-1/2 inches when closed. This version is the combo kit. 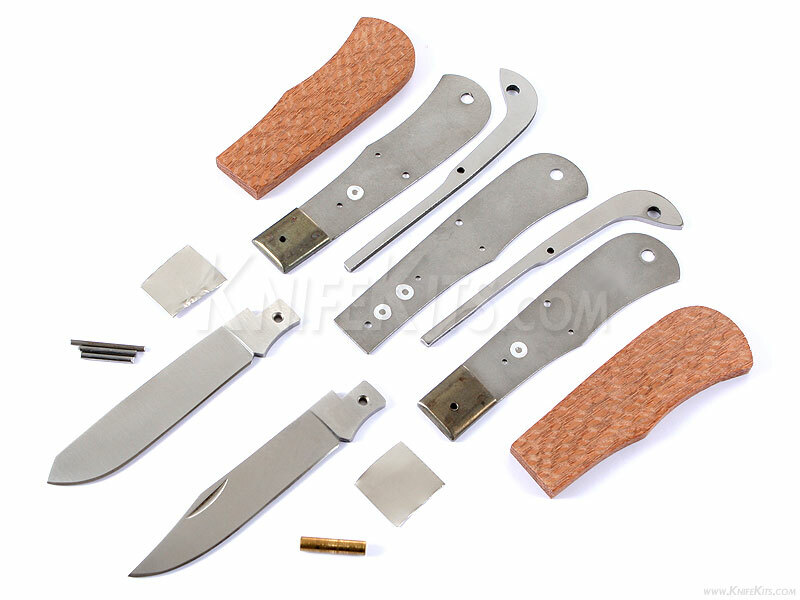 It comes with all knife assembly parts, including pins, springs, thong hole tubing, pre-machined Lacewood handle scales and a gift box. Add a touch of proper finishing and you will create a fabulous multi-blade folding knife that you'll be proud to carry and own for years.